Well, lucky Salty you, I couldn’t be a better expert on running NYC if I were a Tammany. Read on if you want to run the Greatest City in the World like I do! First Things First: MAP YOUR ROUTE and BRING A MAP WITH YOU. One of the most awesome features of living in the big city is that I have an infinite number of routes to take when running. Even though I have been living and running here for years I still often use Google maps to plan out my routes, especially if I’m going somewhere new or unfamiliar to me. On Google Maps you can drag around your Point A and Point B and even drag your route to a particular street or address to increase or decrease your mileage. For any of the routes I suggest here, I highly recommend you map it first and bring a map (or smart phone) on your run to ensure you don’t get lost. If you do find yourself lost, trust your instincts and walk into a store or other establishment where you can ask a local how to get where you’re going. Contrary to our reputation, most New Yorkers are more than willing to help out! Part 1. New York Running is More Than Central Park: Tracks, Parks and Greenways. Park Drive in Central Park isn’t the only fantastic loop course in The City (although I do love running it and it does provide a fine six-mile loop with quarter-miles marked and varied topography). For my money, I’d rather visit Brooklyn’s Prospect Park, which is 4.7ish miles, but the hills are a little more steep and the roadway is a little less crowded. Try ending your Saturday long run with a loop of Prospect Park and finishing at the Grand Army Plaza green market. Bring some cash so you can taste some of the farmers’ goodies! Take advantage of your visit to Brooklyn with one of the best African art collections in the U.S. at the Brooklyn Museum, a leisurely stroll through the cherry trees and roses in the gorgeous Brooklyn Botanic Garden or by lunching in the adjacent Prospect Heights or Park Slope neighborhoods. Those who like running in circles probably know about the 1.58 mile cinder track around the Jacqueline Kennedy Onassis Reservoir, but the more math-minded among us will appreciate the 1/8 mile Riverside Park Track, also cinder, accessible at 72nd street by footpath from Riverside Drive or from the West Side Highway Path. For those who want that stadium track experience, visit the East River Park Track, easily accessible from E. 6th Street by a footbridge that passes over the FDR. Both tracks can be accessed from adjacent bike/pedestrian paths that run along the Hudson and the East River respectively. If you like running along water and want to stay away from car traffic, these are great options for you. The West Side Highway Path (its real name is the Hudson River Greenway) runs about 11 miles from Chambers St. to the George Washington Bridge (at about 180th st), and if you’re looking for bonus mileage you can also continue north through Fort Tryon and Inwood Hill Parks and beyond. Check out the view of New Jersey – you’ll be amazed at how pretty it looks from here! Enter the West Side Highway from nearly anywhere in Manhattan by traveling west until you hit water. Run half as far as you wish, then turn around and go back! The East River Bikeway is an off-road path that travels from the very southern tip of Manhattan to E. 37th street, about 4.5 miles. If you’re traveling north and don’t mind a small detour around the UN Plaza onto 1st Avenue you can continue along the bike route until it ends in Spanish Harlem for a total of 9.5 miles. My suggestion: If you’re staying in Midtown, start at the UN (1st Avenue between E. 49th and E. 37th) and travel South. The 4.5 mile route will take you to the South Street Seaport, where you can grab a beer and some food. Another option is to continue on the path, which will eventually run you through Battery Park and up to the West Side Highway path. Trail running is possible in Manhattan, and if the 2 mile Central Park bridle path isn’t enough for you, try visiting my favorite park in NYC, Inwood Hill Park. You’ll be amazed how the forest draws you in and makes you forget about the other 8 million people around you. There’s a great network of trails (use a map like this one, not on the official NYC parks site), some paved and some packed dirt, and if you’re adventurous, it’s easy to jump off the trail and start climbing boulders and exposed bedrock that put Central Park’s famous rocks to shame. Bring a compass, because it’s easy to get turned around in here! Better yet, join the Inwood Hill Runners on a group run! 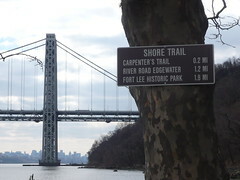 Trail heads who aren’t afraid of getting off the beaten path a bit may also want to check out Van Cortlandt Park in the Bronx, which has a number of wooded trails, many with rich history, and it’s easily accessible by taking the 1 train to 242nd Street. My recommendation is to get in touch with The Van Cortlandt Park Track Club, which has a great Saturday morning group run at NYC’s premiere cross-country course. The members all start together in VC Park, then peel off into groups that vary by pace and desired distance. Part 2. NYC Running Clubs: Make Friends With the Locals! If you have the time, I suggest you try meeting with one of the many running clubs in town, especially if you find yourself in the Big Apple often. Who knows – you may even make a friend for life! One of the advantages of so many people in such a small place is that there’s something for everyone! We have running clubs for all kinds of people. Who do you want to run with? The LGBTQ crowd? Young hipsters? Cross-country runners? Drunks? Speedy Trackletes? Women Masters Runners? We got that. Among all 5 boroughs we’ve easily got at least 25 running clubs you could visit for a run. A dozen of them are in Manhattan, and all have open runs you can join. Here is a pretty good, comprehensive list of some of the bigger teams, although it’s missing one of the biggest, the North Brooklyn Runners, and the awesomest/drunkest/raciest team of all, the Hudson Dusters (you can ask me for details about that one)! Paragon Sports – Recommended if you’re looking for a running bra, inflatable travel weights or a hiking pack…or all three! A three-floor department store located just off Union Square at 17th and Broadway, Paragon is NYC’s largest local sporting good store. I love going to the women’s running section and staring at what may be the largest collection of running bras I’ve ever seen, including a huge selection from Moving Comfort. Not only do they have a great selection of running shoes and gear, they also carry every other sport item you could possibly need plus luggage and travel stuff too. To learn more about their group runs, that include long runs and speed work, check out their Running Blog or talk to someone in the shoe department. JackRabbit Sports – Recommended for a more local feel to your running store and for running peripherals like foam rollers, resistance bands, and gels/bars/Nuun/etc. and info on local races. Here you can find that LRS video gait analysis we all love, a modest-but-quality selection of running shoes and apparel as well as triathlon gear, including wetsuits. Their selection of Moving Comfort brand bras is a close rival to Paragon’s. Free group runs are organized from most of their stores and even free yoga classes – the best way to find out more is to call the store nearest to you or to get on their email list for the latest info. If you’re looking for your next amazing pair of shoes visit their flagship store on 14th Street between 5th and 6th Aves. and talk to Kay, who’s so knowledgeable about shoes she could probably sell me on a pair of golf cleats for running! Super Runners Shop – With six locations that create a ring around Central Park (plus one in Downtown Brooklyn), Super Runners Shop seems to be everywhere you are in upper Manhattan. 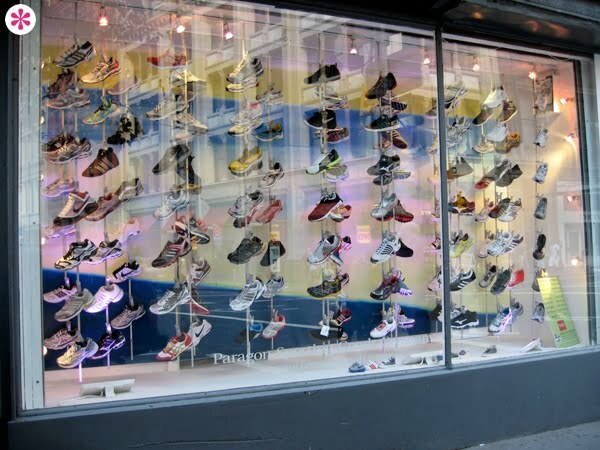 The stores are small but they have a solid selection of the most popular shoes and apparel and the sales staff is always really friendly and quick to help you find what you’re looking for, even if they don’t have it. They also have free group runs on weekends leaving from the Brooklyn (Court St. at Atlantic Ave) and the Lexington Avenue (at E. 89th St) stores. The Running Company isn’t exactly local and has only 2 locations in New York, but I just love them. Their selection is no better than any of the stores above, but the stores feel more open, more luxurious, more… special. Maybe it’s because I don’t get up that way often. Their location in the Time Warner Center mall in Columbus Circle has a Yoga for Runners class at 9am on Saturdays ($10 donation suggested) and group runs in Central Park 5 days a week. Any number of other stores – Seriously, it seems like there are a million little shops all around the city that I pass by and wonder “huh, what’s in there?” I just listed the ones I know best, but if you think there’s something else I should include, let me know in the comments! 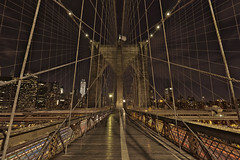 The Brooklyn Bridge is for early morning and night running. Everyone wants to cross it, but you want to run it and claim your slice of Grimaldi’s pizza as your trophy. My word of advice? Do it at dawn before the tourists are awake and avoid getting literally stuck in the crowds. Better yet, do it at night when The City is all lit up and you can see the Freedom Tower twinkle – Brooklyn Bridge is one of the safest night runs, since there are always people out and it’s flanked by NYPD precincts. And for goodness’s sake, please stay out of the bike lane! On the other side: Take the stairs to grab an ice cream cone at Brooklyn Bridge Park and stroll along the promenade to the twinkling city skyline. To continue your workout: Bypass the stairs and follow the bridge to Downtown Brooklyn. A quick jaunt up Tillary St gets you to Cadman Plaza, where there’s a rubber track. Hello, speed work! The Manhattan Bridge is for breathing room. A popular choice for commuters who want to avoid tourist crowds, the Manhattan offers a beautiful view of the Brooklyn Bridge, a bird’s-eye view of laundry on the rooftops of tenement buildings in Chinatown and easy access to Brooklyn Bridge Park and even outlets you close to Grimaldi’s famous pizza shop. Best of all, it’s not very popular with tourists so you have lots of space, making it ideal for a tempo run. Another cool feature is watching the B, D, Q and N Subway trains roll by (be prepared, they’re loud!) and waving to little kids inside them. Be sure to run on the South side of the bridge, which is for pedestrians only–the north side is for bikes and skaters. On the other side: See Brooklyn Bridge above. To continue your workout: you’re just a hop-skip away from the beautiful brownstone-lined Fort Greene neighborhood, one of my favorite places to run. The Williamsburg Bridge is for people-watching. See 1.5 miles of the famous Williamsburg hipsters in their natural habitat. Watch them ride their fixy bikes to the Lower East Side, read their ironic graffiti under your feet, check out all their 90’s clothes! What’s really great about the Williamsburg Bridge is that crossing it feels really safe. You’re tucked into the center of the bridge and surrounded by steel girders and beams, isolated from auto traffic. As long as you keep right and avoid the bike traffic you’re as safe as can be. On the other side: Off the bridge jackknife to the left, then turn north on Bedford Avenue for about 10 blocks to end your run with a delicious hipster snack before hopping on the L train back to Manhattan at N. 7th St.
To continue your workout: follow Roebling St. North to McCarren Park, where there’s a popular-if-crowded running track or turn south toward Kent St., follow Kent to Flushing and circle back around to the Manhattan Bridge. The Queensboro Bridge is for an urban experience. The 59th Street Bridge, the Ed Koch…whatever you call it, for some reason this bridge doesn’t quite get me “Feelin’ Groovy.” In fact it feels more intimidating than the Manhattan, even though they both have little more than a chain-link fence between you and a very long drop to the East River. What I love about it is that it’s really high, so it’s great for a hill workout, and I love seeing weird-but-nifty Roosevelt Island underneath me as I cross toward Long Island City, Queens. You’ll wind up underneath where the LI Expressway meets the BQE, so at first it can appear like an under-the-highway industrial wasteland, but Long Island City is much more than that! On the other side: Modern art-lovers rejoice! MoMA’s PS1 museum is just a few blocks away from the bridge. Jackknife to the left and then turn south on 21st STREET. In less than 1/2 mile you can see some of the most cutting-edge art in the world. 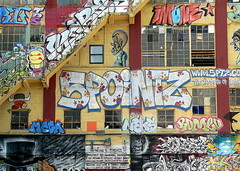 The truly adventurous can also walk 1 block east from there to Jackson Avenue, where you can find 5 Pointz, one of the greatest legal graffiti-art spaces in the U.S., which is sadly scheduled to be torn down before September, 2013. To continue your workout: Follow 21st Street south toward the Pulaski Bridge, which takes you into North Brooklyn. Map a route to loop back to Manhattan over the Williamsburg Bridge for a great 10 mile run (if you’re staying in Midtown East). Whoa, this bridge is HIGH UP. Sure, the GW takes you to New Jersey, but I highly recommend it as a fun way to get out of the hustle-and-bustle for a little while. When crossing the bridge, be careful coming around the tight corners at the towers – oncoming cyclists may have a hard time seeing you. On the other side:Pack a picnic in a backpack (there’s also a grocery store on the Jersey side if you don’t want to carry stuff). Take a right off the bridge and follow 1.5 miles of bike path around Palisades Park to the Ross Dock Picnic Area. Have lunch under the towering Palisades with one of the most beautiful views of NYC in existence. To continue your workout: Palisades Park has a wealth of beautiful sights to see. 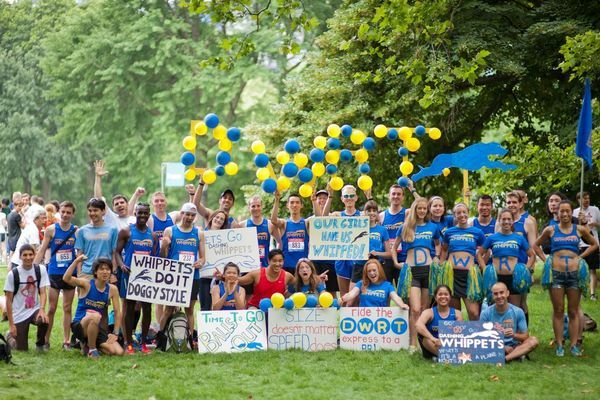 Follow any of its trails for a great out-and-back run from the Upper West Side! That’s it for now, folks! I bet you never thought you’d want to take a running vacation to New York City, but you might now! Did I miss anything? Do you have a favorite NYC route to share with potential visitors? Have you ever, or would you ever run in the Big Apple? 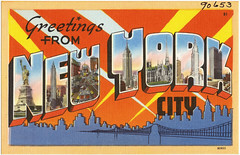 This is a terrific, comprehensive post – it makes me want to take a trip to NYC! Thanks! This is great. When I visit NY for work once a year I love looking up new places to run (but I always hit the 6 mile Central Park Loop too). There’s no better way to explore a city that to hit the streets – in all kinds of weather. The High Line is my new favorite from my last trip. Thanks to your article I have even more places to explore next time! Just don’t try to RUN on the high line – they’ll kick you out! I know it’s crowded, but frankly I’ll never understand why we’re not allowed to run up there, at least during the early and late hours. It’s so pretty, and such a fun, weird place! Thanks for reading, Jessica! I hope next time you visit the city you can try one of these routes. Let me know how it goes!